The Smooth-Coated Otter is a proficient and ready swimmer, able to travel in water for long distances. When swimming slowly, it paddles efficiently with its large, strongly-webbed hands and feet. When swimming fast, it holds its front paws close to its body, and propels itself with its flattened tail and strong back legs. These otters have been seen swimming out to sea in family groups. 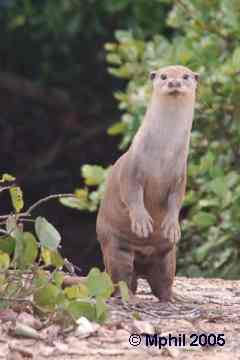 These animals have the usual humped otter gait on land, and can move quite rapidly. They will travel large distances overland looking for suitable habitat. Maxwell (1960) relates how rapidly Mijbil moved on land, and his climbing and jumping abilities. It is often not appreciated that all otters apart from the Giant and Sea Otters can jump and climb quite well. Smooth Otters make less use of the tripod stand than smaller otters, possibly because much of their environment is muddy - they seem to prefer periscoping up in the water. The photo shows a Smooth Otter standing (click it for a larger version).